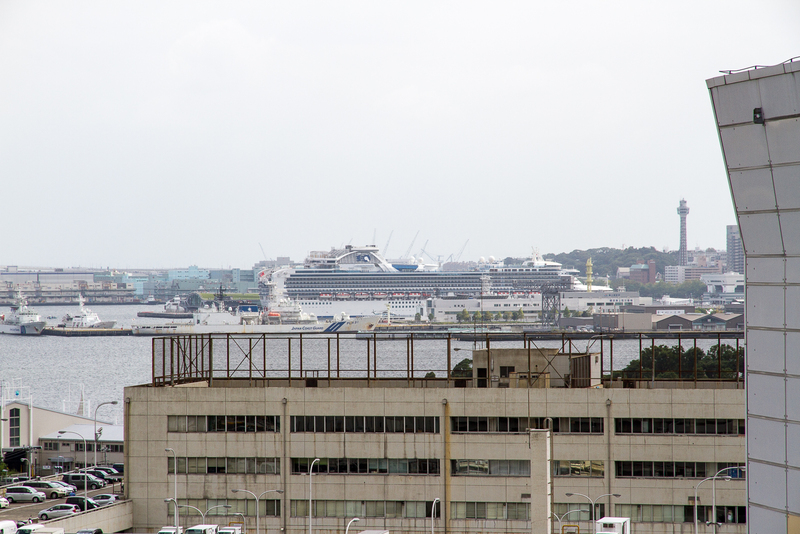 Our new place in Yokohama has a view of the port and Osanbashi Pier, the international passenger terminal. It receives ferries cruise ships from all over the world like the Queen Elizabeth, Celebrity Millenium and regularly has Princess Cruise liners that traverse from Yokohama to cities up and down the Japanese archipelago and in China, Korea and Russia. Today, the largest of the Princess cruise ships in Japan, the Diamond Princess pulled into the the city of Yokohama’s harbour. This City of Yokohama site has a list of all the cruise ships that have called in the past year, plus many other pages of useful info about the port area (here is the Japanese version, but if you scroll down the page there are photos of all the ships that docked in the past year). This time, the Diamond Princess is making a tour from Nagasaki in the south, up to Hokkaido and ending up on the Russian island of Sakhalin, just north of Japan. 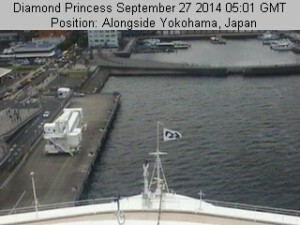 Diamond Princess in the port of Yokohama, Saturday, September 27. By the way, if you want to head out to Osanbashi to see the area, the city has some maps and walking course here. You can easily get there from the east exit of Yokohama station—it’s a nice walk, and I wrote my own little walking tour from the station to that area for Metropolis magazine a couple of years ago. Click on the map and you can download a larger PDF. 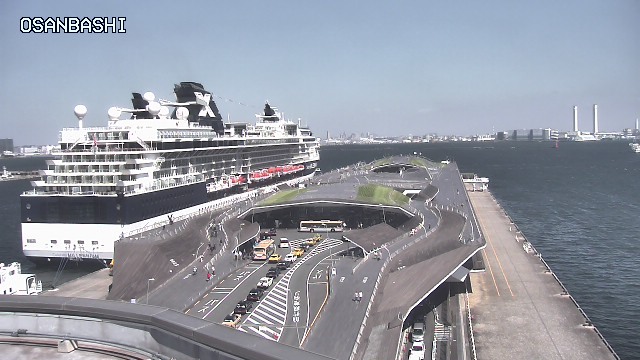 Also, the staff at Osanbashi Pier manage a webcam so you can see the boats from the port’s POV (they also have a twitter account and tweet photos and info at @Osanbashi, if you want to follow). 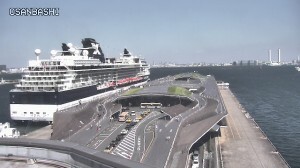 Osanbashi Pier Web Camera Celebrity Millenium, Sunday, September 28.